On April 10, one of American River College’s psychology clubs, Psi Beta, celebrated meeting its goal to raise funds for to help foster children. 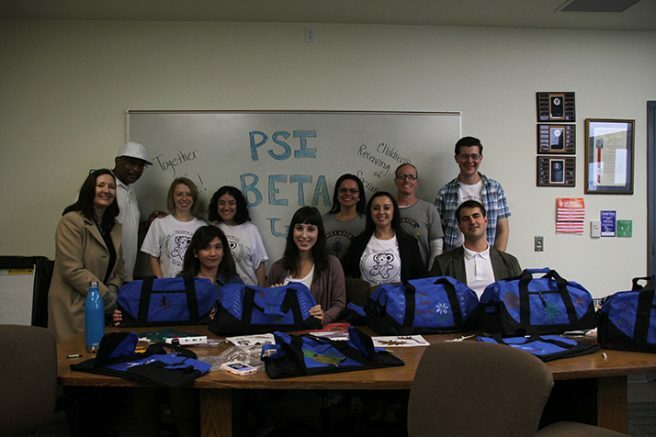 The members of the Psi Beta club are ARC students who are majoring in psychology and have passed certain requirements to be a part of the chapter. “If you have at least 12 units completed in psychology and a 3.25 GPA along with passing specific qualifications, you can be inducted into the chapter,” said Connie Drury, the outreach coordinator at ARC. ARC’s Psi Beta collaborated with a non-profit organization, Together We Rise, which is based in Southern California, to gather essential items for foster children. The program that helped gather the items is called Sweet Cases. The Together We Rise organization has other programs such as Build a Bike or Build a Board, and Birthday Boxes. In the Build a Bike and Board programs, bikes and skateboards are built for foster kids who don’t have a way for transportation, or the items can be given as a gift. For the Birthday Boxes program, boxes are made that are filled with candy, gift cards, and party supplies. The Sweet Cases program involves decorating duffel bags for foster kids that could include a teddy bear, blanket, art supplies, a hygiene kit or a gift card. These items help the foster kids as they’re navigating through the foster care system. “One of the things we like do in Psi Beta is give back to the community, we do this for each semester. We decided to raise some funds to gather some essential items for foster children,” Drury said. The bags were delivered to the Sacramento Children’s Receiving Home. Be the first to comment on "ARC’s Psi Beta team up to help foster children"